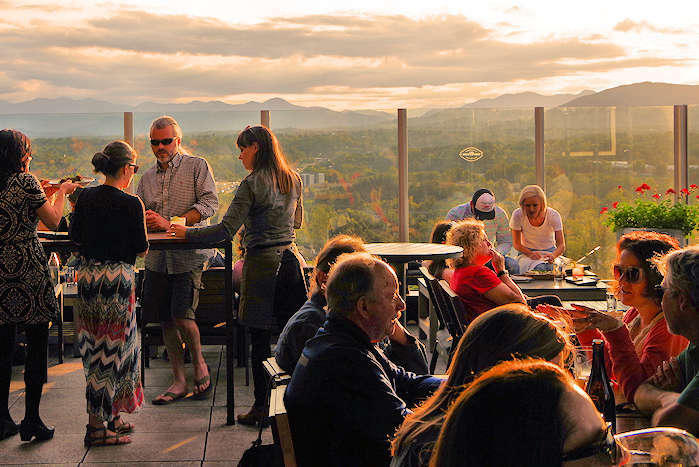 Asheville has been known for many years as "Land of the Sky," so it's appropriate that some great rooftop bars have opened downtown to showcase our famous Blue Ridge Mountains sunsets. 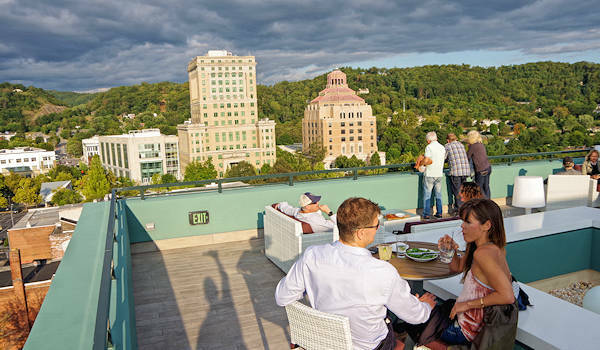 The Montford Rooftop Bar (199 Haywood Street) is perched high atop the 8-floor Hyatt Place Hotel with stellar sunset mountain views from the outdoor terrace or indoor bar (photo above). Their cocktail menu is driven by the seasons and you can enjoy small bites with ingredients gathered at the nearby farmers market. The Montford opens at 4 PM every day and has handy free valet parking - just get your ticket validated at the bar. They even keep extra sunglasses for you to use. During busy seasons they open at noon on Friday-Sunday. Go to their Web site. Pillar (309 College Street) is atop the Hilton Garden Inn at the corner of Charlotte and College. This "garden-to-glass" bar has a fresh list of signature craft cocktails, regional beers and sustainable wines. 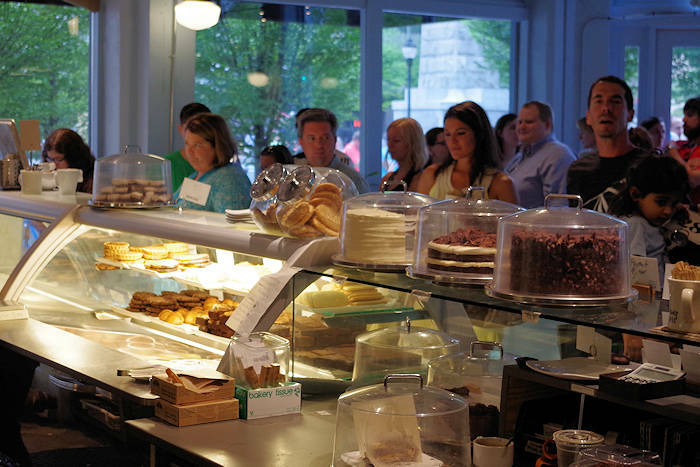 Enjoy your drink with some small plates of southern fusion fare. 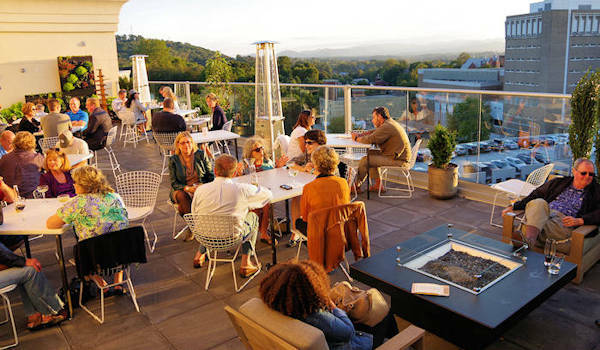 The outdoor terrace is perched on the sixth floor and boasts sunset views of the Blue Ridge Mountains. They also have a large indoor lounge with large windows to enjoy views year-round. It's an easy walk from Pack Square Park. They open every day at 4 PM, closing at midnight on Sunday-Thursday and 2 AM on Friday and Saturday. Go to their Web site. Hemingway’s Cuba Restaurant & Bar (15 Page Avenue) is perched on the fourth floor of the new Cambria Hotel, adjacent to Grove Arcade. 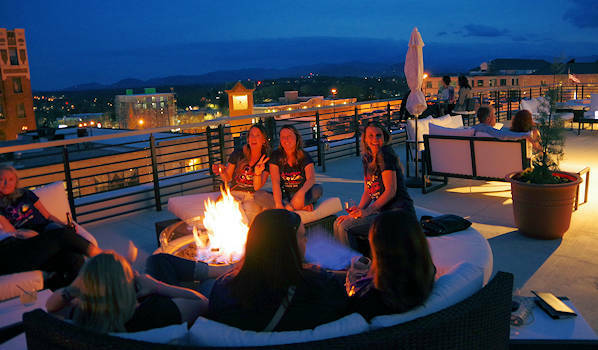 On the outdoor terrace, gather around a firepit or cozy bistro table to soak in the Blue Ridge Mountain and downtown views. The home of the Cuban Daiquiri, Hemingway's Cuba has a great list of craft cocktails, local beer and wine to pair with authentic cuisine from Havana. Go to their Web site. 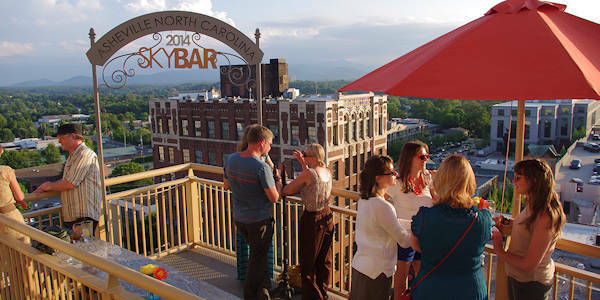 AC Hotel (10 Broadway) has a big rooftop bar overlooking Pack Square Park and Asheville's beautiful art deco City Hall. From big sofas for a group of friends to small bistros for two, the swanky Capella on 9 delivers! With your drinks, unwind with a tapas-style menu. They are open every day, complete with a large indoor bar if the weather is not great. Enter through the hotel lobby on Broadway and take the elevator to the 9th. Social Lounge (29 Broadway Street) has been a local favorite for many years. It's owned by Chef Anthony Cerrato, who also owns Strada Italian next door. 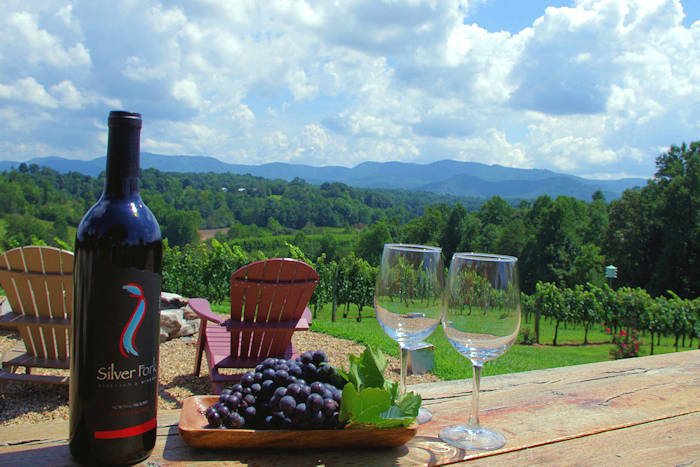 Enjoy an array of cocktails blended from fine liquors and house-made elixirs, international wines and local beers on tap. Their small plates are designed to share. 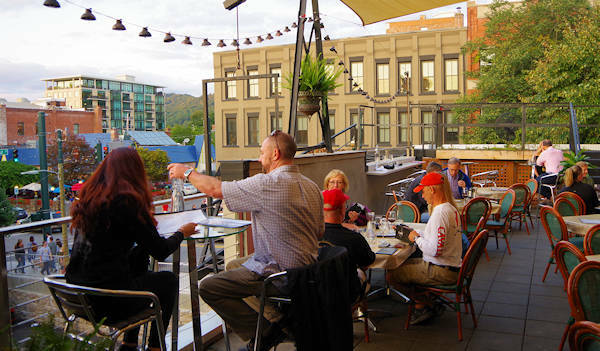 The stylish space has bars on two floors, complete with a cozy rooftop patio above the busy street. They open at 3 PM every day. Go to their Web site. SkyBar (18 Battery Park Avenue) is a unique venue situated on multiple fire escape terraces atop the historic Flat Iron Building. Ride the original elevator to the top for panoramic sunset views of the distant mountains. Their menu includes cocktails, beer, wine and appetizers. Be sure to get your picture made under their sign, complete with the year. 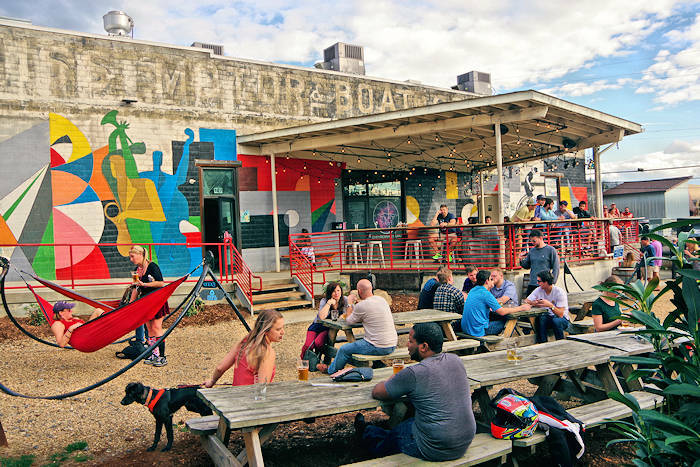 They open at 4 PM Monday-Friday and 3 PM on Saturday and Sunday during the warmer months (no indoor space).